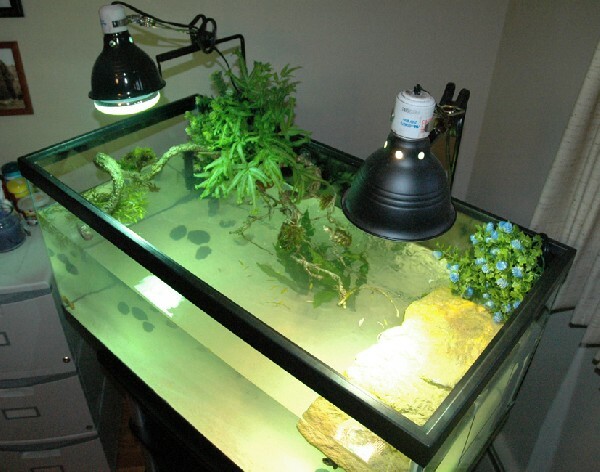 Description: We'll , I got my 40 gallon breeder set up a couple of days ago. It's stocked with my 2 1/2 inch concentric diamondback, a couple of algae eaters, a few snails, two african cichlids. Diamonback eats Krill, Gammarus, and some Reptomin. Hasn't messed with the snails or Cichlids- yet anyway. Specs Below- Would appreciate any comments. If anyone wants to see any photos I can email them. Turtle Dock, 7" X 15.5"
Suspended vines with live moss and attached live fern.